Betterment Gifts is one of the coolest innovations in personal finance this year. If you’re not familiar with the online investing service you can read more about how it works in this Betterment review. The reason I think it’s such a great idea is that it’s something I’ve wanted for years. For my wedding, and most of the ones I’ve attended in the last decade, I’ve always thought that the gift giving process could be improved. It seemed a waste when well-intending guests spent a lot of money on gifts that the bride and groom didn’t want and sometimes just sat in basements or attics for years. I would actually sit in weddings and think about a cool online gift registry service where the couple would list out their life goals or needs and then friends and family could give money towards making those happen. I even sketched up a notebook full of plans for building such a service and registered the domain MoneySmartGifts.com but unfortunately it never got built. Did they register for any household items at all? They itemized gifts on the registry included outdoor furniture and a BBQ for a future deck, as well as furniture for their future apartment. They do plan on using this money to buy and furnish their home, but until they reach their goal of a down payment on an apartment they want to invest the money. How did they let guests know to use Betterment registry? Did most people use Betterment Gifts? Yes, this was how people gave gifts to the couple. At first, Jon’s parents felt uneasy about them registering his way. They thought he should be asking for a dinner set or silver, but Jon and Polina live in New York – very few entertain at a 12 seat dining table. It may seem ‘traditional” to ask for gifts, yet this tradition has only been around since the first gift registry in 1924. Many of Jon’s recently married friends ended up returning their gifts or asking for cash – it just didn’t make sense when they already have homes set up. A gift registry like this better aligns the lasting gift people wish to give, with the goals of the couple. Jon’s parents eventually came round to the idea. They contributed to Jon and Polina’s goal of a future vacation. We think Betterment Gifts is most comparable to the savings bonds people used to give at special occasions like weddings. Betterment Gifts is the next generation of savings bonds – a gift for the future, with the convenience of modern technology. If a person has a short term goal, can they set it up to be funded into a low risk or cash equivalent? So the money doesn’t take a big dive right before they pull it out. If someone is investing in a short term goal they would have a relatively conservative allocation. The idea however, is to invest in long term goals. The investment will be worth more the longer it is invested. That said, a cash equivalent option is on our road map for the future for shorter term goals. 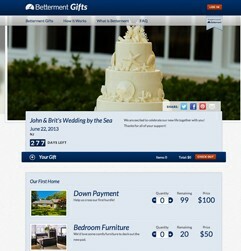 My guess is that most people wouldn’t use Betterment Gifts exclusively for a wedding. I can see some spouses refusing to use it all or maybe just agreeing to use it as one of their registry options. However a couple decides to use it, I think it’s a great option to have. Of course it’s not limited to just wedding gift registries, that’s just what I discussed here. What other ways would you or someone else you know consider using it?